HomeBlogSEOPaid, owned or earned media, where should you spend your money? While each facet of marketing, paid owned and earned, has its own benefits, is there one – or a combination that’s guaranteed results? While each of the above terms each has numerous aliases, many of which you’ll be familiar with, it is in this format (paid, earned or owned media) that you may well have come across this question. In the past, though the answer was never easily found, there were factors that could be weighed and measured and definitive answers given as to the correct mix of the three channels to use which could be given with reasonable certainty. This is no longer true except on an individual campaign basis – each offers its own unique benefits to a business and while there is no doubt that owned media (done skilfully) can earn results as far as rankings are concerned, there is always the chance that a competitor’s well executed PPC campaign could pip your brand to the post at the moment query becomes intention, and the same could be true of the PPC campaign pipped by a recommendation from a trusted influencer. As the internet age advances, and consumers and search engines become savvier, each of the three main pillars of search marketing has developed its offering in direct competition with the other, so that a successful brand strategy can little afford to ignore any of the others. In truly Ronseal fashion (doing what it said on the tin), paid media refers to any exposure for which you have paid – including PPC ads, native content, remarketing etc. The paid media offering, however, is far from simplistic – it has developed an awful lot, as you would expect from a service that has now been around for almost 20 years. The levels of personalisation and the varieties of ads that can now be served to consumers are so great, and native advertising and sponsored content so well embedded in the mainstream media (and invulnerable to adblocking software) that the paid media offering is capable of reaching people effectively at all stages of the buyers journey. Earned media is a term applied to any content or conversation surrounding your brand which is earned through your activities in the paid and owned media disciplines and through outreach. Earned media is slightly more diffuse in description, but insofar as narrowing it down to a particular marketing activity, could most easily be applied to content marketing and outreach activities, which – with the rise of influencer marketing – is increasingly important to brands of all sizes and is an area that is seeing a lot of growth as a result. Owned media is any content or conversation disseminated through channels your brand owns – i.e. your branded blog, website content and social channels. You only have to look as far as the brands you enjoy yourself – it would be surprising if they did not maintain a presence on every applicable social channel as well as a branded blog. It is no longer a bonus interaction with consumers as it may have been less than a decade ago; it is almost a minimum requirement. For this reason, the demand for high quality output has never been higher. The truth is, there is no longer a single route or strategy for success and there has never been. Every brand has specific needs and wants regarding their marketing, and so the particular strategic blend is, more often than not, going to be different. What has become apparent, however, is that it is a blend that is required. What we’re looking at is (as I’ve argued elsewhere) is a shift toward an holistic industry with sub-specialisms rather than three distinct practices. Interest in SEO has levelled from its historic high in 2011 (at the release of Panda, with which the industry would become familiar). PPC interest has levelled after seeing a steady downturn for a few years. This would, I imagine, relate to the amount of separate paid offerings which are searched for independently – such as remarketing, display etcetera – cannibalising the paid search interest. While content marketing (the closest service term to earned media, as stated) is showing a steady increase over time. While these charts, from Google Trends, don’t deal in volume but comparative interest over time, what you can see are peaks of novelty – SEO at the implementation of Panda, PPC when Google implemented a small business PPC offering and, latterly, in content marketing. In conjunction with this, however, is a steady increase in interest for the term ‘digital marketing’ (or ‘search marketing’ as we like to call it), with peak interest having to be redefined regularly (and again with the latest data point). Increasingly, brands are looking to agencies and in-house teams for full service digital marketing – operating across skillsets – and the reason for that is that each of the skillsets has become indispensable to the creation and execution of a successful online marketing strategy. Think of your brand as a platform with three uneven legs – each of these categories, paid, owned and earned media are wedges which can help stabilise that platform and render it secure enough to build upon. Your brand will, of course, have its plans and projections – outlines of strategies and ambitions for growth; it should also have some idea what it requires to achieve these ambitions. It is these requirements that will determine how you apportion your budget to each of your paid, earned and owned media endeavours. Clearly, for the majority of brands, the primary aims are growth and revenue increase – but these can be achieved in multiple ways. 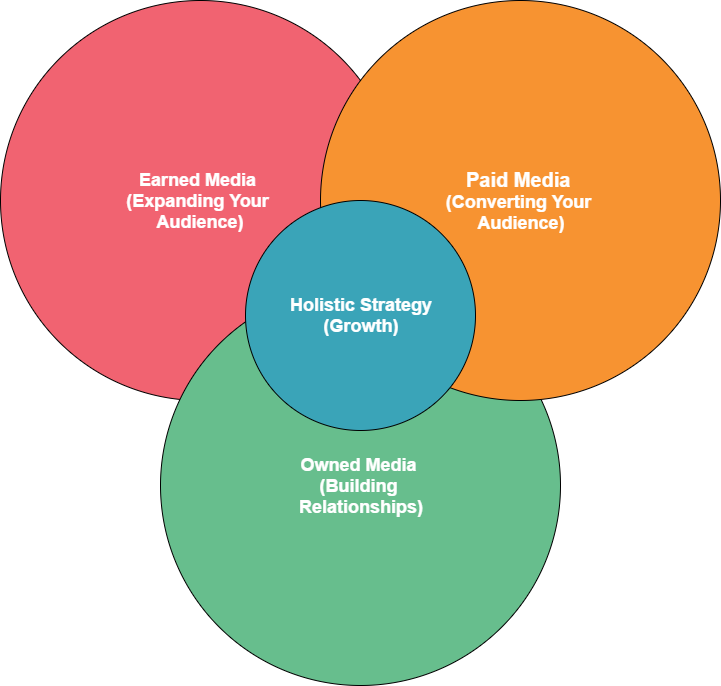 Paid media (as all three of these methods do) has some overlaps with the other two, but insofar as broad brush strategy preparation is concerned, paid media can be viewed as the best method for converting your current audience. It offers a substantial number of opportunities to be present at each of their levels of purchase intention and, while it obviously has the capacity to reach consumers far beyond your own, the ability of conversion rate optimisation to improve efficiency, or remarketing and other cookie based personalisation make it a powerful tool for earning the most from your present consumer base. Earned media (as above – in broad brush terms) can be seen as the best method of building your consumer base. With strategic content dissemination and outreach, PR, influencer marketing and the like, you can look to extend your reach beyond that which you’ve already built. It also, as mentioned earlier, has the benefit of building on work done in each of the other areas, helping it to fill the top of your sales funnel. Owned media, therefore, is best viewed as a method of building relationships, earning trust and will generally be the main injection of impetus into your earned media. By creating unique, high quality and audience relevant content for your owned media channels, you can inspire your audience to become brand ambassadors and build a rapport and relationship with your consumer base – allowing you to not only maintain good relations, but also ensure that your brand is first in their mind when they have further need of your products or services. This hopefully demonstrates the need for an holistic approach to search marketing – with paid, earned and owned media each playing a part, to greater or lesser degrees, in a successful strategy, represented as a point at the intersection of all three disciplines in the Venn diagram of branding. Click Consult has been involved with search marketing for almost as long as there has been search marketing. For more actionable advice, check out our resources – or find out what we can do for your brand by contacting us today.